ALYATEC has created an environmental exposure chamber (EEC) in Strasbourg, offering to public researchers and pharmaceutical companies a unique research tool in the world. This environmental exposure chamber, also called allergen challenge chamber, allows to carry out clinical studies under reproducible conditions to validate desensitization treatments and new therapeutic drugs to treat symptoms of respiratory allergies such as asthma, rhinitis and conjunctivitis. ALYATEC’s allergen challenge chamber also helps fundamental research on respiratory allergies, which today affects nearly 30% of Europeans. More generally, this expertise for research and clinical trials concerns all respiratory pathologies linked to the environment. It makes possible to study mechanisms of action of these diseases and to develop new therapeutics. Thereby, ALYATEC’s allergen challenge chamber contributes to the improvement of the patients’ daily life. 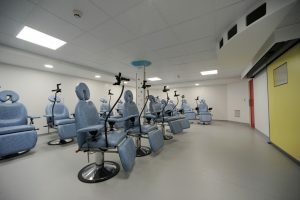 New in France and unique in the world, this environmental exposure chamber located in the New Civil Hospital of Strasbourg is used under the scientific and medical supervision of Professor Frédéric de Blay, leader of Chest Disease Department. Very innovative, ALYATEC allergen challenge chamber has been entirely designed to allow the safest and most controlled allergen provocation tests. Allergens used are validated by ANSM. ALYATEC’s allergen challenge chamber is a new generation chamber, unique in the world, which results from the meeting of Professor de Blay, a pulmonologist at the University Hospital in Strasbourg, and a leader of industry, Albert SAPORTA, former CEO of Stallergenes. The first one in which it is possible to carry out exposures with respect to all allergens. The first one using allergens extracts registered in the ANSM (National Agency for the Safety of Medicines and Health Product).